We are offering an excellent quality of Niobium and Tantalum Alloys. 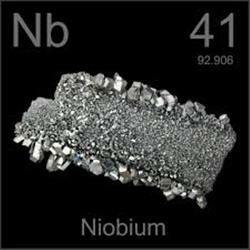 Niobium less than 2% of all niobium is used in the metal form. Niobium metal is employed in chemical plants since it is one of the most corrosion resistant metals available. As a pure metal it is also used as superconducting material. Niobium-based alloys are also important structural materials for high temperature applications, in addition to their corrosion resistance and superconducting properties. Over 20 strategically positioned warehouses ensure a steady supply of CBMM products. 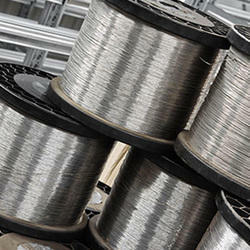 End uses of niobium metal and its alloys include superconducting magnets for magnetic resonance imaging equipment (medical diagnostics), nuclear magnetic resonance (analytical applications) and microwave cavities in high-energy particle accelerators. 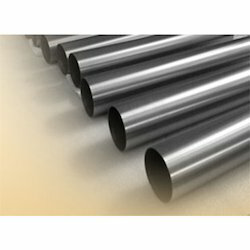 ASTM B-392: Standard specification for Niobium and Niobium alloy bar, rod and wire. • ASTM Specification B 391 "Standard specification for Niobium and Niobium ingot alloys, R0-4200 Type I Reactor Grade Unalloyed Niobium"
Looking for Niobium Plate ?